Few of us will forget the images plastered on the nightly news last year of “lean finely textured beef” (better known as “pink slime” after the news report). But did you remember that it was veteran newswoman Diane Sawyer who broke the story? I didn’t. But lawyers for Beef Products Inc. (BPI), the company that made the beef product, certainly didn’t forget who was the first to tell the world about the product and label it pink slime. So it was no surprise that they sued in September, 2012, alleging that Sawyer’s reporting amounted to defamation, costing the company hundreds of millions of dollar and putting 700 American workers out of jobs. What was a surprise was that the case survived all the legal wrangling that goes on before a case can actually make it to trial. But it did. Proving defamation is notoriously hard in the U.S., where journalists like Sawyer have broad powers of discretion and companies or individuals who allege defamation have to prove that the network negligently reported a false statement of fact that injured BPI’s reputation. The fact that Sawyer and the network’s promotions department used the phrase “pink slime” 137 times over the span of four weeks on its newscasts, the ABC website and on Twitter wouldn’t necessarily rise to that level. But this seems to be a case where both sides in the argument have facts that might sway a jury — and what at first looked like a desperate attempt at repairing its reputation by a company that was on the ropes now looks like it might be one of the most important defamation cases in recent years. It’s one of the first major challenges related to a news organization’s use of social media. One key piece of evidence cited in BPI’s lawsuit is a Tweet by ABC reporter Jim Avila, who wrote: “It’s just not what it purports to be. Meat.” One of BPI’s arguments is that ABC News intentionally portrayed its product as something other than beef, in spite of USDA approval of it as a beef product that has never been cited as unsafe. There are months of legal wrangling ahead before a jury hears the case (if it ever reaches that point), but here are the key points that seem likely to come up if recent filings hold true. On one hand, neither Sawyer nor ABC said that BPI’s product is dangerous, and courts have repeatedly offered broad protections for journalists in the course of their work. On the other, one of the key sources for the story was a former BPI employee who had lost a wrongful termination suit against the company, ABC’s lead reporter “mischaracterized” BPI’s product on Twitter, and the network failed to clearly explain what BPI’s product was for, and how it was used in the nation’s food supply. BPI founders Eldon and Regina Roth are those rarest of plaintiffs: people who have the willingness and the resources to spend whatever it takes to prove their point. The size of the lawsuit is, they say, equal to just three years lost income — and is less than a fifth of the annual income of ABC’s parent, The Walt Disney Company. But the case isn’t about money, the Roths insist. They say that it’s about a company that produced a safe product, followed the law, and provided good jobs with benefits in towns where those are hard to come by, but got blindsided by a reporter who used imprecise language to describe something she didn’t understand. And in the process, irreparably harmed the Roth family, their business, and their employees. Meanwhile, ABC and its parent company insist that the case is about the very cornerstone of American democracy: the right of the press to freely report on the news that affects American citizens. And what affects us more than the ingredients that go into the foods we eat, or serve to our children? How well the two sides explain the law of defamation to the jury. It’s not an easy thing to do, and in case after case, polls taken of jurors after the case have often shown that they had no idea how to define it even after they’d sat through the evidence. Who’s more credible — the earnest entrepreneurs from South Dakota (the Roths), or the smiling newswoman who’s been on our TV screens for over 30 years? Lots of experts will take the stand — and some of the science is sure to be interesting and complex. But a lot of the case will boil down to who’s more credible. It almost always does in a civil case. Juries tend to vote in favor of the person they most identify with — sometimes that’s the plaintiff — and sometimes it’s not. How many pictures of “pink slime” and how many revolting lists of ingredients the defendants get into evidence. It’s a sad fact that once the image of something called “pink slime” gets into your brain, it’s hard to reconcile that image and label with anything resembling healthy food. And it’s possible the jury will side with the defendants here just because they don’t want to think about pink slime finding its way back into a product they might eat. 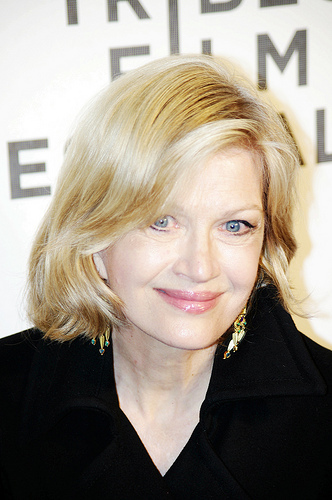 Photo credit: Photographer David Shankbone made this photograph of Diane Sawyer available on Flickr under a Creative Commons License. Gallery | This entry was posted in Law, Social Media and tagged ABC News, Beef Products Inc., Beef Products Inc. lawsuit against ABC news, BPI defamation suit against ABC, David Shankman, Deb McAlister-Holland, defamation, Diane Sawyer, free press, free speech, law, legal, libel, pink slime. Bookmark the permalink.